The Mexican Silver Libertad is a 0.999 fine silver coin produced by the Mexican government in response to the popularity of other silver bullion coins, such as the American Silver Eagle and the Canadian Silver Maple Leaf. The coin has lesser demand than most silver bullion coins, but remains in demand in Central and North America as a reputable silver investment. Read on to learn more about the Mexican Silver Libertad. The Mexican Silver Libertad is minted by the Casa de Moneda de Mexico, or the National Mint of Mexico. The first silver mint in the Western Hemisphere, it was established by Spain in 1535. For more than three centuries, enormous amounts of silver found in prolific silver deposits by the Spanish Empire were turned into coins here. Over its history, the region has yielded an estimated 10 billion ounces of silver. Today, the National Mint of Mexico continues its centuries-old tradition of minting some of the finest silver bullion coins in the world. The other side of the Libertad coin features the Winged Victoria statue in front of two volcanoes, Popocatepetl and Iztaccihuatl. Winged Victory, also known as the Angel of Independence, is a major historic monument and considered to be the symbol of Mexico City. Meanwhile, the volcanoes refer to a pre-Columbian Mexican legend. This design is based on the Mexican gold Centenario coin, produced from 1921 to 1947, and has been found on Silver Libertad coins since 1991. The view of the statue was changed in 1996 to an angled view; the pre-1996 coins are sometimes known as Type 1 Libertads as a result of the change. Since 1990, Silver Libertad coins have been minted in several sizes ranging from 1/20 ounce fractionals to 5 troy ounces. Mintage rates vary greatly between different sizes. The wide range of convenient sizes available has made the Libertad popular with precious metal investors. The Libertad is also available in several sizes in gold bullion. The 1 ounce size is by far the most popular Mexican Silver Libertad. It measures 40mm in diameter and is 3mm thick, comparable to the dimensions of other 1 troy ounce coins. It was first minted in 1982; 1,050,000 were produced that year. Production has remained fairly steady over the life of this coin, with 1,000,000 minted in 2010, with one notable exception. 1997, 1998, and 1999 are noted for relatively low mintage figures, making coins from this year particularly desirable. Libertads are struck in Proof and Brilliant Uncirculated quality. Proof Libertads are among the most valuable of any modern proof silver coin. 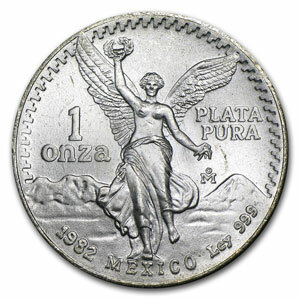 Unlike silver bullion coins produced by other countries, the Mexican Libertad does not have an official face value. It is typically sold at a premium over the spot price of silver, similar to the premiums for American Silver Eagle and other government-issued bullion coins. Libertad prices for less common years, such as 1997-1999, are not as strongly affected by spot prices for silver.